Tattie scones come from Scotland, potato farls (also sometimes called potato bread) come from Ireland, but they are essentially the same thing. They are a great way to use up leftover mashed potato, and are usually served as part of a cooked breakfast or as an afternoon snack spread with butter and jam. Peel your potatoes and cut them into equal-sized chunks. Add them to a pan of salted water, bring it to the boil, put a lid on and simmer for 15-20 minutes until they are tender. Drain and mash together with the butter, salt and pepper. Add the baking powder and half of the flour. Mix well. Add more flour until it you can't get any more in - you should now have a fairly firm dough that holds together. On a floured worktop, roll out a disc of dough about the size of a saucer or soup bowl and 5-6mm (quarter of an inch) thick. Use a saucer or soup bowl as a guide and trim off any excess. Cut the disc into 4 wedges. Heat some fat (dripping, lard, butter or oil) in a frying pan and add the scones. Cook for a bout 3 minutes each side until golden brown. Butter them and serve with a cooked breakfast, or with jam for an afternoon snack. The video above is from the Keef Cooks YouTube channel. 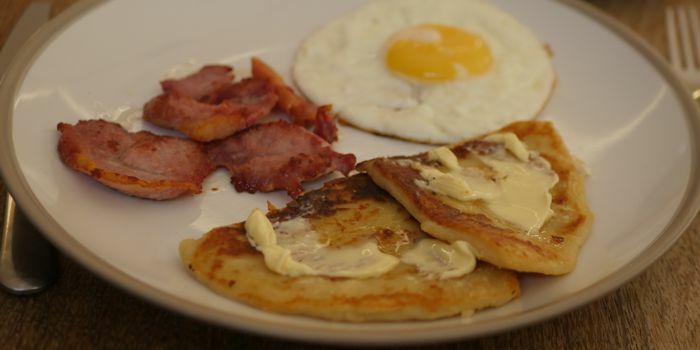 Click here to see the video recipe of Tattie Scones / Potato Farls on YouTube.